Dave (Stormy) was going through snook withdrawal so I thought I might be able to put him on some snook if we took a bit of a drive. We headed down to the Peace River to work some docks. We launched at Harbour Heights boat ramp around 7am. The water temp was about 80 degrees with a high of 85 in areas. It was to be a slow incoming tide all day. We worked the mouth of Whidden Bay and the nearby island with no luck. We headed down river to a cut into the Shell Creek area. 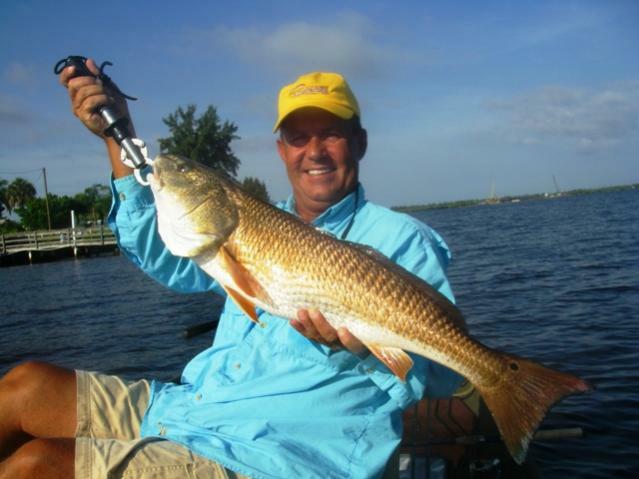 Finally at 7:25am I hooked a landed a 20 1/2" redfish on the Spook Jr. No more strikes on topwater so we headed over to work docks on the south side of the river. At 8:10am, I picked up a 15 1/4" trout near a dock on the 4" Rip Tide Mullet in shadflash. All fish by Stormy and myself were caught on this lure the rest of the day though we did try other lures in different areas. It was this lure we used under and around the docks. At 8:43am, I threw against some rip rap and my lure got crushed. It was a good snook. She put up a great fight and I slipped her in the net. She measured 30 1/2". A few minutes later, we came up upon a dual-hulled sailboat and I skipped my lure under one side of it and let it sink to the bottom. I pulled up and my line was moving off. I set the hook and immediately knew it was a good fish. The fish was pulling drag and giving me all I could handle. After a great fight, the fish surfaced. 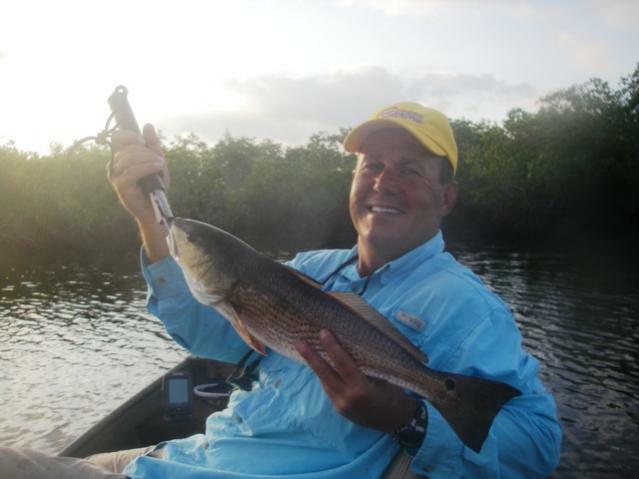 It was a large redfish. Finally I was able to subdue this beast at 8:55am. She measured 30 1/2" also. She was very fat and healthy. At 9:03am, I caught a 20 1/2" snook. 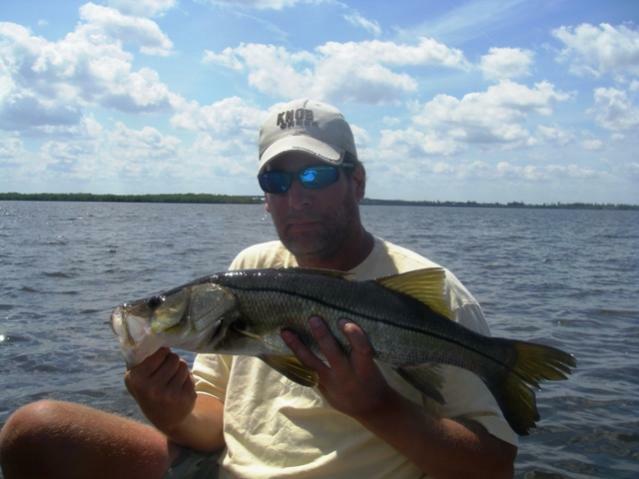 As I am recording my catch, Dave gets on the board with a nice 24" snook just three minutes later. I picked up a small 14 1/4" snook at 9:18am. We decided to hit the 75 bridge on the south side, but when we got there the wind made it unworkable. It was only 3' deep anyway. We headed over to the north side of the river and began to work docks going down river. We had gone through a two hour lull until I finally caught a 19 3/4" snook at 11:17am. Dave had just lost a monster that had broken him off on a dock post. We lost probably 10 snook yesterday between us and both of us lost a couple of extremely large fish under docks that just flat out spanked us. Dave caught a nice 26" snook at 11:25am under a dock. Another long lull where we worked some islands, flats, and the north side of the 75 bridge. I lost a decent snook at the bridge and Dave lost a good one near a point just below the bridge. We headed up to work more docks on the north side of the river. Finally at 1:54pm, I picked up a 19" snook under a dock. 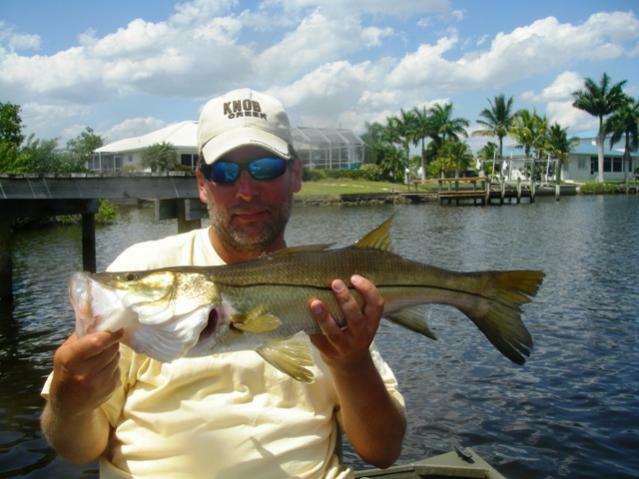 Dave landed a 22 1/2" snook under the same dock just two minutes later. I caught a 20 1/2" snook at 2:05pm. 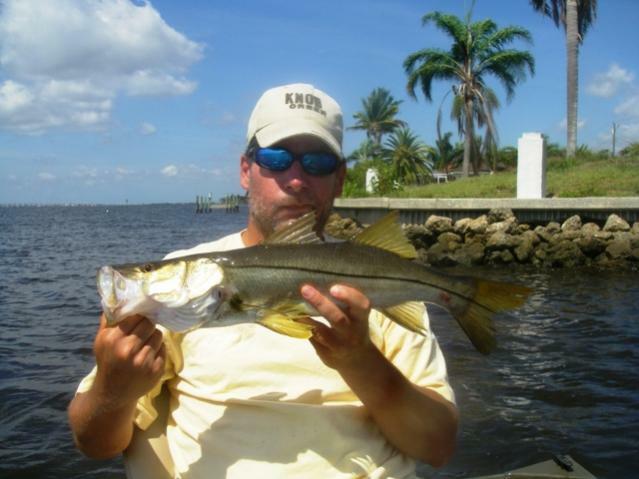 Dave landed a 19 3/4" snook on the side of a dock 10 minutes later. At 2:28pm, Dave had just caught a 19" snook when I caught a 16 1/4" redfish under the same dock. I picked up a 22" snook in front of a dock at 2:55pm. Four minutes later, Dave hooked and landed a very nice 27 1/4" snook under a dock that was no more than a walkway. At 3:38pm, I caught a 21 1/2" snook under a dock. At 4:15pm, I caught a 21 1/4" snook near a dock. At 4:27pm, I picked up a 15 3/4" trout near a dock. At 4:44pm, I caught a 23 3/4" snook under a dock. The wind had really picked up by now. We headed back into Whidden Bay and worked a few docks to no avail. We tried for some reds in there too but had no luck. We made an attempt to find the tressle in the Shell Creek area but made a wrong turn and ended up on the south side of the river again. We began to work more docks. The final fish of the day was a 20" snook I caught at 7:12pm. A storm was approaching fast and it was getting dark so we headed for the ramp. It was a phenomenal day. We caught some good quality fish and were schooled by some much bigger ones. If you want a true test of your angling abilities, try skipping some soft plastics under boat docks. It is pretty **** fun!!! Nice guys, the dueling Daves do it again. 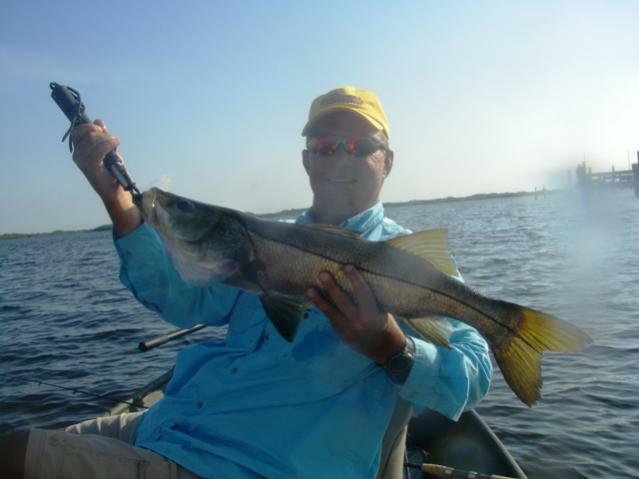 I canoed the upper peace river river many years ago and remember seeing many monster snook. Those are some nice fish there. Imagine if you had whitebait.... Hahahahaha. Awesome job guys! On the flats and mangroves yeah the whitebait woulda killed it but under the docks I don't think it makes a difference and might even get less on whities especially when tide was rippin. If tide was slow and you could weight them down it would work but the ole shadflash under a dock is hard to beat. lol that IS my excited look!